Fast, dense, upright tree to around 40 ft tall by 20 ft wide. Thrives in intense heat, poor soil and drought conditions. Small clusters of cream color flowers in Spring. Fast growing, open to about 30 ft tall by 20 ft wide. Weeping nature will give light shade to plants underneath. Creamy flowers in early Spring. Fast growing, about 20 ft tall by 20 ft wide. Multi trunk long green leaves and yellow flowers in the winter. Spreading medium fast to 25-30 ft tall and 15-30 ft wide. Leaves have peppermint fragrance when crushed. Alternate variety with purple new growth that mature to dark green leaves. White flowers spring to summer. Around 30 ft tall and wide, large green leaves, clusters of pink flowers in fall. Attractive red peeling park resembles manzanita. Small edible fruit in winter. Slow to medium growth 15-30 ft with equal spread. Shaggy brown bark. Dwarf variety 6-8 feet tall. Slow to 50 ft tall and wide. Strong limbed tree with upright spreading limbs. Crushed foliage is fragrant small yellow flowers turn to tiny black fruit. Medium growth to 20-40 ft tall by 15-30 wide. Dark green leathery leaves. Tolerates many poor growing conditions heat/drought/poor soil. With maturity may produce round yellow orange fruit. Trim every couple years to reduce older fruiting wood. Slow to medium grower to 20-30 ft tall by 20-35 ft wide. 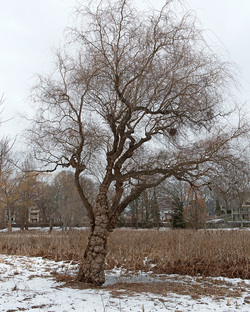 Open spreading habit with weeping outer branches. Early spring flowers, summer yellow/red fruit that will drop. Shaggy reddish bark is attractive. Takes heat and drought conditions well. Fast growth to 25-40 ft tall and wide. Trunks on old trees very gnarled. Clusters of cream flowers will turn to rosy fruit in the fall. Messy, plant away from concrete and drains. Takes heat and drought well. Fast growing to 50-60 ft tall 20-30 wide. Ferny leaf dark green leaves. Large orange flower clusters in spring. Compact growth to 20-30 ft tall and wide. Bay leaves are aromatic and can be used in cooking small yellow flowers in spring. Can be shaped with pruning easily. Larger rounded leaf and a more tree like habit than the species. Slower growing to 15-45 ft tall by 10-30 wide. Small yellow flowers in late spring/ early summer. Nice bark that peels showing patches of white on brown. Smaller glossy green leaves. Very clean. Fruitless olive that occasionally will bear small crops of fruit. 25-30 tall and wide, slow to medium growth. Grayish green leaves. Trunks will become gnarled with age. Very tough trees take most conditions. Likes heat and dry summer areas. Fast growing to 25-40 ft tall by 15-30 wide. Open habit fine almost ferny leaves will drop if winter are cool enough. Lavender blue flowers will appear between spring and summer usually. Young trees are susceptible to freezing. Likes heat and well draining soil. Upright growth 20-40 ft tall by 15-25 ft wide. Good replacement for Birch trees with spongy white bark that peels. Little to regular water. Pendulous young growth. Fast growing with tolerance to heat, cold and poor soil. Medium sized tree, full canopy averages around 30 ft x 30 ft. Small lacy leaves turn purplish red in fall. Easy cleanup many of the leaves drop all at once. Most consistent fall color for mild winter areas. 25-30 ft tall and wide. Benefits from pruning when young. Luck of the draw male (fruitless) or Female (fruiting) trees. Grafted seedless male variety of the species with consistent fall color. Fruitless plum variety about 18 ft tall by 12 ft wide. Single pink flowers before dark purple leaves in the spring. Little to no fruit set. Dwarf fruitless plum growing usually 12 x 12 ft. Single pink flowers in early spring. No fruit. Purple leaf with strong columnar shape 20-25 ft tall with only a 5-6 ft wide spread. Some fruit. Flowering cherry to 25 ft tall and wide. Light pink flowers. Good disease resistance. Early flowers. Weeping growth to 10-12 feet tall and wide Pale pink flowers. Branches will often touch the ground. 40 feet tall by 30 feet wide. Single light pink, almost white flowers in appear in spring. Fast growth. Newer variety of Bradford flowering pear that fixes problems of the old variety. Improved branching and higher fire blight resistance. 20 -25 ft tall by 20 ft wide. Flowers profusely in spring with white flowers. Nice fall color. Glossy dark green leaves. Partially deciduous in Contra Costa County. 15-30 ft tall and wide with drooping branches. Glossy dark green leaves. More often grows wider than tall. Tolerant of many conditions. Is prone to fire blight though. Around 20 ft. tall. 10 ft wide Deep red flowers. Red new growth and fall color. Large crape myrtle 25 ft. 15-20 ft wide. Light lavender almost pink flowers. Faster growing than most crape myrtle. Large crape myrtle average 25 ft. by 15-20 ft wide. White flowers, large leaves. One of the first crape myrtles to flower in the summer. Also faster growing. Slight weeping growth. Smaller size tree average around 9 ft. tall by 8 ft. wide Deep purple flowers. Similar to Natchez but less weeping branch habit. Darker flower hot pink flowers than Tuscarora, about 12 ft tall by 8-10 wide. One of the first crape myrtle to flower in summer. Large oak 40-70 ft. Large trunk. Very upright while young, spreading with age. Dark green, deeply cut rounded lobed leaves. Fast growth once it gets into ground water. Large oak 40-80 ft tall by 40-60 wide. Large leaves with deeply cut lobes hold on to branches through the winter. Deep rooted, good street tree. Hybrid tree. Fast open growth 20-30 ft tall and wide. Has large flowers pink flowers and large green leaves. Tough plant takes dry areas nicely. Tall round 40-60 ft tall and wide. Changes color late in fall orange and red. 35-45 ft tall and wide. New growth emerges red with fiery red fall color. Good shade tree. 24 ft tall by 18 ft wide. Smooth gray bark. Rounded head. 40-50 ft tall by 30-40 ft wide. Very nice shade, spreading canopy. Good american elm alternative. Fast growth 40-60 ft tall and 40 ft wide. Tall pyramidal crown large uniquely shaped leaves. Bright yellow fall color. Tulip shaped yellow/green flowers in spring. Likes deep rich soil. Fast growth 40 ft tall 30 ft wide dark purple pink flowers in drooping clusters in spring. Tolerates poor conditions. Can spread by suckers. Very fast growing, large tree 30-50 ft tall and wide. Large leaves give excellent shade. Tree is tough. No fruit.